In the ongoing debate about whether or not carbohydrates – ‘carbs’ – make you fat, one bakery has inadvertently come down with a not-so-subtle affirmation that, ‘Yes, they do!’ The bakery has done this with its own advertising. If there’s such a thing as an ‘own goal’ in the bakery business, this bakery has surely kicked an own goal. I have no idea why a bakery would think it a clever marketing strategy to go to all the trouble of manufacturing the life-sized mannequin seen in these photographs and placing it out the front of the store to attract customers. Surely the sub text of this model of a baker holding trays of bread and cakes is to announce to the public, loud and clear, that, ‘Our product makes you fat’ or ‘Our carbs make you fat’ or ‘People who eat our grain based foods get fat’. When I first noticed this statue outside a store near my home, I could not resist taking these shots. At first I thought it was a once-only gaff by an individual shop owner. But then, as I have travelled further afield, I have noticed more of them. Maybe these guys really want to help get the message out there that we need to be cautious of the grain component of our diet. 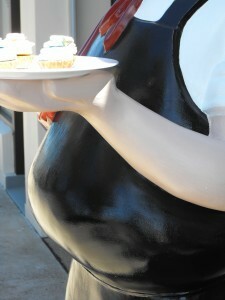 Okay, the advertising shown here makes an appeal to a deeply set and preconceived notion that bakers are chubby people. But why do we have this deeply set preconceived idea in our bread eating culture? Is it because there is an underlying truth to it? We may not need a peer reviewed scientific research paper to tell us that large amounts of carbs – grain based foods – are not necessarily all that good for us. We may only really need to look at how the bakery industry thinks of itself. I recommend that, for an in depth dealing with the issue of cereal based foods, people read two books cover to cover. The first is, ‘Wheat Belly. Lose the wheat, lose the weight, and find your way back to health’. By William Davis MD. ISBN 978-1-60961-154-5. Published by Rohdale, Inc, 733 Third Avenue, New York, NY 10017, USA. The second is, ‘Grain Brain. The surprising truth about wheat, carbs and sugar – your brain’s silent killers’. By David Perlmutter, MD, a prominent American neurologist. ISBN 978-0-316-23480-1. Published by Little, Brown and Company, 237 Park Avenue, New York, NY 10017, USA. In a time when food stores are starting to become more aware of the need to promote the health benefits of their products, who in the world would run an advertising campaign like the one seen in these pictures?